According to Dayang Hjh Joriah Hj Metali who wrote an article about him in the Pusaka journal, Dato Hj Ahmad was born in a cemetery when his pregnant mother died and was buried. He lived in Kampung Burong Pingai and taught the Quran, Islamic Laws and other religious material to the people of Kampung Burong Pingai, Kampung Buang Tekuruk and Kampung Lurong Dalam. Sultan Abdul Momin appointed him as the Supervisor for Islamic Development and he was also appointed a kadi. He turned down the title of Datu Seri Maharaja. He taught a number of Bruneians and was buried at the Jalan Residency cemetery when he died. Pehin Siraja Khatib Abdul Razak Hassanudin (1879-1939) was born in Kampung Burong Pingai Ayer, and learnt from religious teachers around the village. He also travelled to Sibuti and Kelias and while there, he was appointed as the imam for the mosques in Sibuti, Kelias and Papar. He was an active writer, especially in writing syair, under the pen name of Abdul Fatah. Many of his syairs featured the society and their way of life then. He has many students, and he was appointed to a number of positions in the government. In 1913, he was appointed as a kadi, in 1918 as Pehin Khatib, and in 1919 Sultan Muhammad Jamalul Alam II appointed him as Pehin Siraja Khatib Al-Kadi Brunei. He was also appointed as a member of the State Legislative Council. Pehin Khatib Muhammad Hassan (1860-1941) was born in Kampung Lurong Sikuna, and his father frequently brought him to visit Semporna and Sundar to find work. During those visits, he learnt about Islam from the Islamic scholars in the area. He taught Islam from his own home voluntarily, and many students came to learn from him. His house was frequently visited, and a special prayer hall was built nearby to avoid congestion at his house. He died when he was 80 years old. Mudim Hj Yahya Sidek (1890-1942) was taught religious education by his own grandfather, Allahyarham Pehin Udana Khatib Saidi. He also learnt from other religious scholars, such as Pehin Datu Imam Haji Abdul Mokti and Pengiran Digadong Pengiran Haji Mohammad Salleh. He was very firm in teaching and his students studied diligently under him. He was also active in writing, and he wrote about the rules of nikah (marriage) entitled ‘Kaifiyat Bernikah-nikahan’ and this handwritten rules was dated September 4, 1936. He died when he was 52 years old. Pehin Khatib Abdul Razak Abdul Rahman Sambas’ (1875-1943) family was originally from Sambas, and his father moved to Brunei after migrating to Sarawak. He married a Bruneian and Pehin Khatib Abdul Razak was born at Kampung Limbongan. Pehin Khaib learnt religious education and also mastered English, Chinese and Tamil. He was an active writer but none of his writings had survived. He continued to educate himself on various aspects of the religion and would often call a preacher to the mosque to discuss and learn from him. He also travelled to Sabah and Sarawak to learn from the religious scholars there. He was conferred the title ‘Mudim’ by Sultan Ahmad Tajuddin in 1930, and appointed as Jurunikah in 1939. He was conferred the title Pehin Khatib before he died. Tuan Imam Abdul Rahman Awang Matseruddin (1872-1945) was taught religious education by his father, and he furthered his knowledge by learning from other religious scholars. He actively taught religious education to many students and for that he was awarded the title Pehin Khatib. In 1939, he was conferred the title Pehin Tuan Imam. Marbut Awang Tunggal Chuchu (1880-1945) was quite well-known. 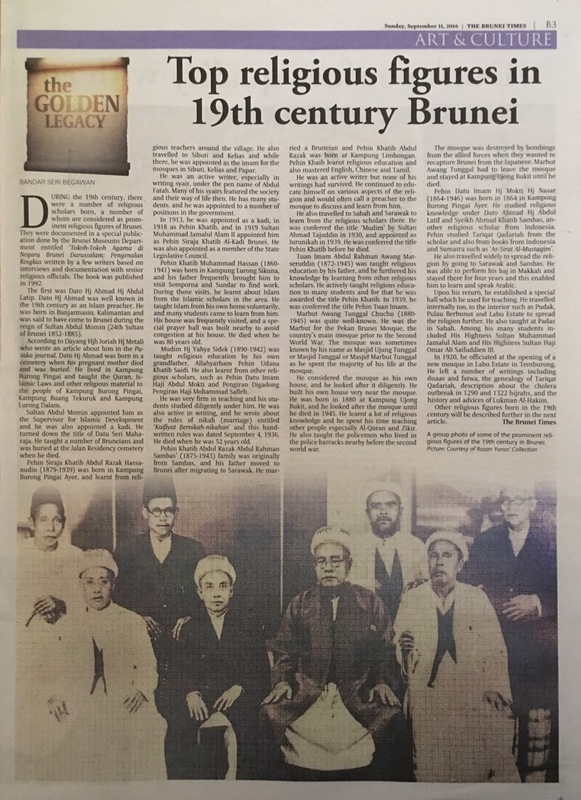 He was the Marbut for the Pekan Brunei Mosque, the country’s main mosque prior to the Second World War. The mosque was sometimes known by his name as Masjid Ujung Tunggal or Masjid Tunggal or Masjid Marbut Tunggal as he spent the majority of his life at the mosque. He considered the mosque as his own house, and he looked after it diligently. He built his own house very near the mosque. He was born in 1880 at Kampung Ujong Bukit, and he looked after the mosque until he died in 1945. He learnt a lot of religious knowledge and he spent his time teaching other people especially Al-Quran and Zikir. He also taught the policemen who lived in the police barracks nearby before the second world war. The mosque was destroyed by bombings from the allied forces when they wanted to recapture Brunei from the Japanese. Marbut Awang Tunggal had to leave the mosque and stayed at Kampung Ujong Bukit until he died. Pehin Datu Imam Hj Mokti Hj Nasar (1864-1946) was born in 1864 in Kampong Burong Pingai Ayer. He studied religious knowledge under Dato Ahmad Hj Abdul Latif and Syeikh Ahmad Khatib Sambas, another religious scholar from Indonesia. Pehin studied Tariqat Qadariah from the scholar and also from books from Indonesia and Sumatra such as ‘As-Sirat Al-Mustaqim’. He also travelled widely to spread the religion by going to Sarawak and Sambas. He was able to perform his haj in Makkah and stayed there for four years and this enabled him to learn and speak Arabic. Upon his return, he established a special hall which he used for teaching. He travelled internally too, to the interior such as Pudak, Pulau Berbunut and Labu Estate to spread the religion further. He also taught at Padas in Sabah. Among his many students included His Highness Sultan Muhammad Jamalul Alam and His Highness Sultan Haji Omar Ali Saifuddien III. In 1920, he officiated at the opening of a new mosque in Labu Estate in Temburong. He left a number of writings including duaas and fatwa, the genealogy of Tariqat Qadariah, description about the cholera outbreak in 1290 and 1322 hijrahs, and the history and advices of Lukman Al-Hakim. Other religious figures born in the 19th century will be described further in the next article.